Fit-Ink: Have Stroller, Will Travel? My old college and post-college roommate had a baby girl earlier this week. My childhood friend had a baby boy at the end of March. My training buddy had twins, a boy and a girl, on the vernal equinox. Needless to say, I've been thrown into all things baby full-throttle between their updates and reading the news about which Hollywood celebrity is about to pop next. So when my eyes scanned across The Daily Stroll starting up at Universal Sole in June, I immediately thought of these friends and their newborns. The only problem is that only one of them (my Chicago training bud) can try this class that gets you exercising with your stroller and baby in tow. The Daily Stroll offers a mid-day workout in a family friendly Chicago neighborhood that gets you moving with the kiddos in tow. No babysitter to borrow, no nanny needed. You just need to bring yourself, your babes as long as they're at least five months old and can sit up in a stroller, and a stroller, preferably one that can handle the city sidewalks and can be used in "athletic activity." Prepare yourself for a power hour that not only revs your cardiovascular system with walking but also strength trains while using your stroller or your baby or both. Class is by Jennifer Dixon of You Grow Girl! Fitness and brought to you in part by Universal Sole. With classes starting up on June 7 and running through October 4, every Tuesday from 11 a.m. to 12 p.m. is baby day at 'da Sole. And you won't have to sacrifice any of that college fund you just started saving for--class is free and you only need to contact the store and sign a waiver to start participating. Then you're on your way to sculpting yourself back to pre-baby shape or fine-tuning those muscles with a new method. How many times have you heard you need to switch up the routine to see results? Now's your chance. Click here to read more about The Daily Stroll and all of its registration details. Baby not ready to join the group in June? 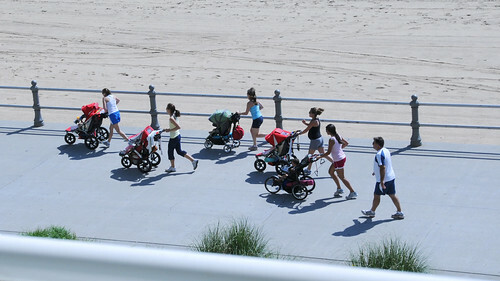 You can follow this routine and do it on your own to reap the stroller's upper body benefits. Photo grabbed from Serge Melki at flickr.